Gates now offers 230 OEM quality branched hose part numbers covering more than 76 million vehicles in operation. Gates branched radiator hoses and accessories offer increased service life with less maintenance. We have invested in new application coverage for this product category to provide Gates customers with an alternative to dealer-only parts, a competitive advantage in today’s service market. The Automotive Aftermarket unit of Gates Corporation, a leading manufacturer of industrial and automotive products, today announced the addition of 22 molded branched radiator hose to its line of Original Equipment Manufacturer (OEM) quality automotive aftermarket hose. Gates factory molded branched hose are designed to fit popular applications such as 2009-10 Ford F-Series and 2009-11 Ford Focus vehicles. 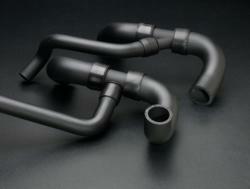 The complete line now includes 230 hose, making it the most comprehensive line in the automotive aftermarket industry. Because Gates branched hose products cover 76 million domestic, European and Asian vehicles in operation, installers save time sourcing parts. All Gates branched radiator hoses are engineered to resist electrochemical degradation for increased service life, and most feature PowerGrip® SB clamps that provide maintenance-free performance and never need retightening. OEM quality connectors eliminate coolant leaks. The complete range of Gates automotive hose includes molded coolant hose, heater hose, fuel line hose, power steering hose and related products that meet or exceed OEM standards. To learn more, visit http://www.gates.com/automotive. For more information about Gates Corporation, please contact Mari Jane Panek at 303.744.4533.